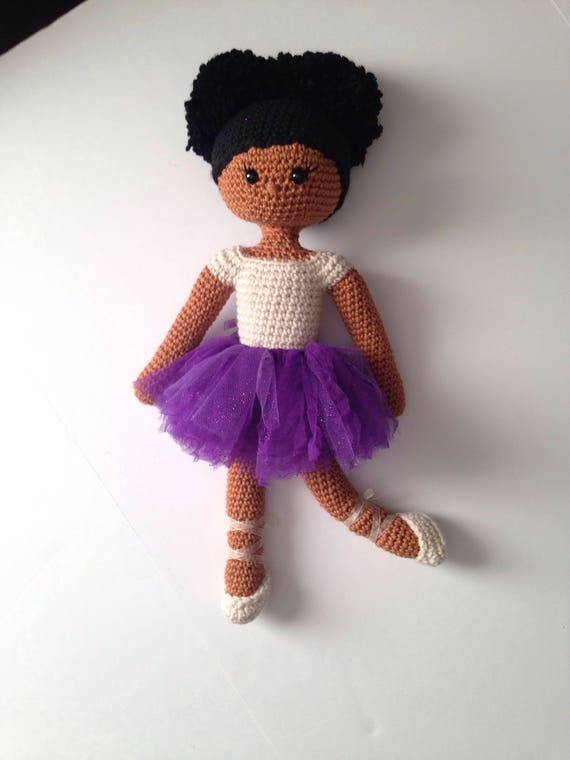 My Pretty Brown Doll Ballerina Review – YIMI: Yes, I Made It! I often feel like the general public believes that crafters just pick up their tools and magic happens. It can typically be the exact opposite. Crafting takes practice. It takes perfecting and improving upon their respective skills. Just like any profession, crafters take classes to hone their skills, improve their skills, or even just refresh their skills. Last summer, my sister asked me to make her a doll for her classroom. At that time, she showed me a picture of what she liked. At this time, I was making baby items and amigurumi items. Let me just tell you that somewhere in my head I convinced myself that making amigurumi and making dolls are two different beasts. So, I told her I would think about trying to make one. Let me just tell you that I spent months trying to create a doll for her. While I thought it looked good, I also believed that I could do better. I googled african american dolls, crocheted dolls, etc. You may or may not be surprised to know that I did not find an abundance of patterns. However, I have purchased several patterns that I will be reviewing in the coming weeks and months right now. Photos via MyPrettyBrownDoll shop at Etsy. 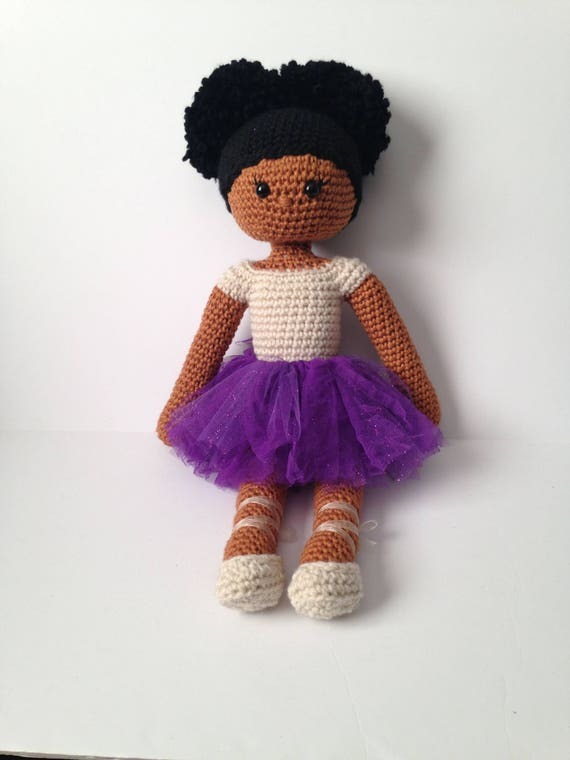 So I purchased the pattern last August but hadn’t attempted it due to school and wanting to design a doll for my sister on my own. Well in January, Yolonda announce that she was offering a doll course where you could learn the tips and tricks to complete her pattern. (Doll Course is available here.) The course was being taught by Aniqua Wilkerson of My Kinda Thing. I will be dedicating an entirely different blog post to the mastery that is Aniqua as an instructor. Unlimited access to live and recorded video lessons available via a closed Facebook group. If watching live you will be able to get answers to your questions in real-time. If you are watching the replay you are still able to ask questions and get answers as well as see questions from other viewers and the answers. I want you all to know that I got all of ^^^^ this and more!! This is not a paid promotion. This is a course that I chose to enroll in to improve on my crochet skills. I was able to learn where I had ‘errors’ in the doll that I created on my own. They would not be errors that you would see if you are not a crocheter. However, they were skills that would make my work stand out and above the rest. The marketing portion of this course had so many nuggets of information. I was able to utilize some of them in my project below. One of the things that I love about this process are the details. What skin tone should I use? What kind of hair will she have? What color leotard? What accessories? What facial expression? When I had completed just the head of the doll, I knew I had a diva ballerina in the making. Her big eyes kept staring at me as though she was trying to figure out why I was taking a break when she still didn’t have a body. See what I mean? Am I not allowed to go to the bathroom? So are you ready to see the outcome of my attendance in the course? My ballerina is 15 inches tall from the top of her head to the soles of her feet. You may notice that she does not have a tulle tutu as in the images from Yolonda’s pattern. I have fiber sensitivity. There are some fibers that make my “skin crawl.” Tulle is one of them. I am planning to get over the sensitivity (if possible) but for now, I crocheted her tutu. It was pretty simple but I will be drafting my pattern to make is available in both Etsy and Ravelry soon. Overall, I absolutely loved this course. Now, I absolutely love how my doll has turned out. I am presently working on modifying the pattern using the skills that I was taught in the course. The outcome and images will be available in a future blog post. Please follow me on social media to see the latest and greatest. You can find my on Facebook at YIMI. I am also on Instagram, Periscope and Twitter as @yimicrafts. Until then, stay safe!